Motorists breathed easy after the first day of fuel protests at oil refineries passed off quietly. There had been panic-buying of petrol in the days leading up to the protests with car owners fearing shortages. The turnout was low but organisers said the campaign was meant to be symbolic, claiming it had already put the government "on the back foot". 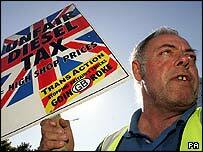 Activists want fuel duty to be cut after a series of price rises driven by massive global demand. Only a sprinkling of protesters turned out at refineries, and tankers came and went as usual, with activists emphasising they had never intended to stop supply. Farmer and haulier Andrew Spence, one of the leaders of this week's protests, said ministers had been forced to make concessions by the latest campaign and denied it had been a damp squib. Transport Secretary Alistair Darling said the government was acting to keep petrol costs down and that "since 1999 fuel prices have come down both in real terms and cash terms, in terms of the duty". The UK Petroleum Industry Association, which represents oil giants Shell, BP, Esso and Total, said prices could fall by as much as 4p a litre next week, as extra oil stocks enter the system. Spokesman Chris Hunt said: "We were prepared for the worst. We are very glad it has been so peaceful, law abiding and low key." Mr Spence said the protests had been important and added: "(Without them) I doubt that the government would have given us the 1.2p freeze in duty proposed for October. I like to think that we have achieved something this week." Mr Spence, who was among a small group of protesters at the Shell refinery in Jarrow, south Tyneside, said: "We didn't want a lot of people here, I would rather there was just a handful of us." At Purfleet in Essex protesters held placards saying "Support British Hauliers" and "End Labour's War on the Motorist". A man from the Isle of Sheppey in Kent was later charged with obstructing the highway. Queuing was orderly, with six separate queues, one for each row of pumps and very little grumbling by anyone. All very British! At the Vopek terminal in nearby Thurrock, one protester who drove his car on to the wrong side of the road to try to block a tanker was moved by police. An ambulance was called after he complained that he had hurt his back. A number of other refineries saw small-scale demonstrations, while others reported that it was business as usual. 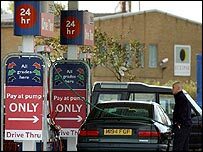 In September 2000 many hauliers, farmers, taxi drivers and others joined the protests - which saw refineries blockaded for a day and then picketed - with fuel shortages hitting motorists across the UK.